I just attended CYSTE (Conference on Cyberlearning Tools for STEM Education) which was a thrill in a number of ways. It was a conference of highly motivated professionals working and researching collaboratively to figure out how best to move forward with technology and STEM education. I was struck by the fact that most speakers were very optimistic about the potential for a positive transformation of education through technology. The conference, held in conjunction with the NSTA (National Science Teachers Association) Annual Conference in San Francisco was held at the Claremont in Berkeley and appropriately, the hallways were decorated with retro technology. For instance: this old filmstrip projector was called a Delineascope and is marked Property of Fowler High School. 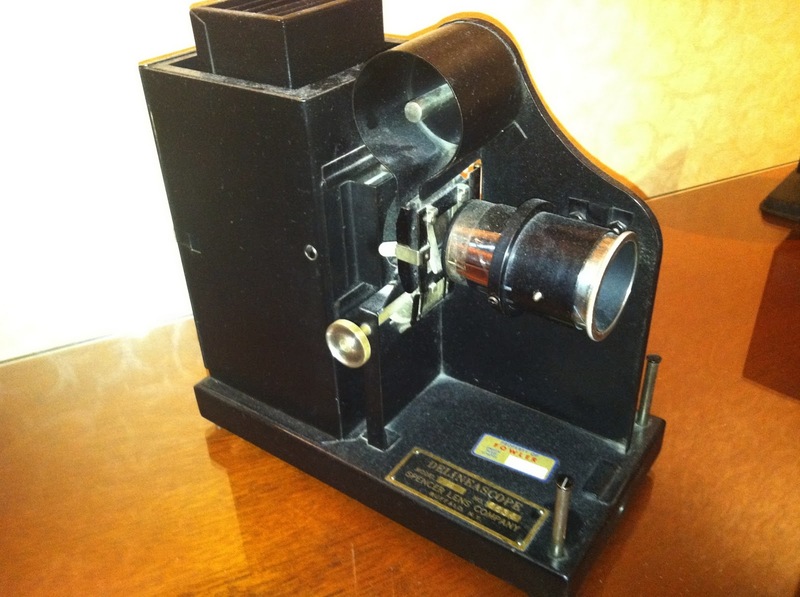 It was made by the Spencer Lens Company of Buffalo New York and is Number 6634. 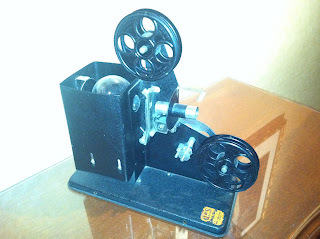 Right next to it was an old film projector.Unfortunately, my cell phone picture of it is not adequate to make out the manufacturer or item number. I appreciated the juxtaposition of spending the days discussing how the Ipads and Android smart phones and other amazing new devices were full of potential to transform education while we had examples of previous transformations sitting in the hall. Schools should not feel hopelessly out fashioned and in many cases, todays schools really feel to students like a visit to a museum. This makes it hard for them to take the schools seriously when they know more about technology and the "real world" than their teachers. It's hard for schools, just like it's hard for people and businesses, to stay current on technology. It's moving fast and it's hard to keep up. This question alone merits a lot of conferences and investment. The nature of work and tools is changing rapidly and surely, the schools should have as one goal that they provide graduates ready-to-work in todays world. Doing research and "science" today is heavily dependent on technology. Yes, there are still beakers and field work but there is a lot of computer aided analysis of organic molecules and remote sensing data of geology. Technology can transform education about science. There are films and games and websites which have had and will have phenomenal impact. But at the end of the day, it's not the gee whiziness of it, it's the content and the activity and the "teaching" that they provide or facilitate. I'd like to use a quote from your comment in a museum display. I'd also like to give you credit.